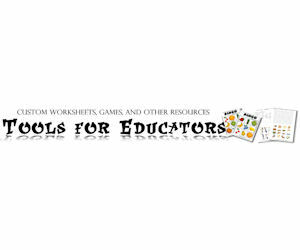 Tools for Teachers - Customized Worksheets, Games and More! FREE worksheets, worksheet creators, printables wizard and on-line teaching materials makers with images from Tools for Educators. Use these printout generators, game makers, and programs for teachers to make and print teaching resources with picturesor text. They are simple, but beautiful, versatile and powerful. Your students (and you) are sure to enjoy the resources.